Be the first to share your favorite memory, photo or story of Robin . This memorial page is dedicated for family, friends and future generations to celebrate the life of their loved one. GOEWEY – Robin L. Goewey, 54, passed away unexpectedly on Sunday, October 21, 2018 at her home. Born June 26, 1964 in Winsted; the daughter of Robert and Carol (Decker) Goewey of Winsted. 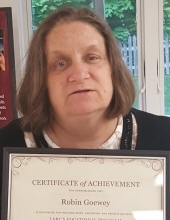 Robin was proud of her work with LARC of Torrington. She was an avid Yankees fan, enjoyed bowling and loved cats. She competed in many Special Olympics achieving many gold medals in different events. In addition to her parents, she is survived by a brother, Edward Goewey and wife Diane of Winsted; a sister, Christine Goewey and her husband Bryan Raydenbow of Winsted; niece, Racheal; nephews, Christopher and Bobby; and many aunts, uncles and cousins. She was predeceased by a brother, Robert “Bobby” Goewey, Jr. Friends may call on Sunday, October 28, 2018 at Montano-Shea Funeral Home, 922 Main Street, Winsted from 2 – 4 PM with a funeral service at 4 PM. Burial will be held at the convenience of the family at a later date. Visit an online guestbook at Montano-Shea.com. To plant a tree in memory of Robin L. Goewey, please visit our Tribute Store. "Email Address" would like to share the life celebration of Robin L. Goewey. Click on the "link" to go to share a favorite memory or leave a condolence message for the family.